The Masterbuilt Model Electric Smokehouse is a revolution in electric smokehouse design. The inbuilt window and responsive remote make the smoking process effortless, but the quality of the unit does not have the build for heavy long-term usage. The unit is very simple to assemble and can be constructed within 15 minutes. There is an internal light, built-in meat thermometer and an easy wood chip loader – all adding to the convenience and ease of use this unit. The unit also has a removable drip unit and water pan, which allows the owner to infuse moisture and extra flavors into the smoked foods. The innovative design features of the unit, namely the remote control and inbuilt window allow the owner to be in full control of the smokehouse and provide a range of fine-tuning options to ensure perfect smoked foods are produced in the owner’s home. 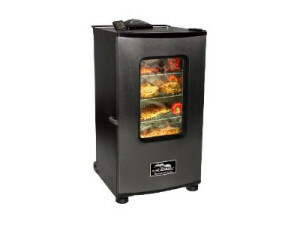 The Masterbuilt Model Electric Smokehouse is a spacious unit, with more than two cubic feet of smoking capacity. Four interior smoking racks provide incredible capacity for smoking large amounts of food. From meats, fish, chicken or jerky, this unit has been built to fulfill your smokehouse needs. The unit poses some design flaws that detract from the overall use of the smokehouse. The built in temperature probe has been shown to be inconsistent and not accurate on the whole. The heat retention of the unit is also an issue, with heat that is produced not being held efficiently or re-used within the smokehouse. It simply dispels quickly from the unit. The overall quality of the unit also is cause for concern, with issues reported with fixtures such as doors, heating elements and paint chipping. Smoke escape points around the door also potentially jeopardize the overall heat quality of the unit. Innovative Smokehouse Design With Short Term Usage In Mind! Overall, the Masterbuilt Model 20070411 30-Inch Electric Smokehouse Smoker with Window and RF Controller is a good smokehouse for those with short term usage in mind. If you know that you are not looking to commit to a long-term smokehouse unit, then you should definitely try it.